We are proud to be listed (in the Youth category) as one of Canada’s top-rated charities for 2019 by MoneySense, a national personal finance website. MoneySense evaluates charities based on efficiency and transparency, helping donors decide which charities are worth their donation. Big Brothers Big Sisters of Canada is listed among the Top 10 Youth Charities with an A+ for fundraising efficiency. The MoneySense Top 100 Charities ranking one of several recent distinctions for Big Brothers Big Sisters of Canada. 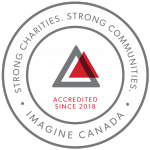 We also recently achieved Imagine Canada accreditation for operational excellence and were named a Financial Post Top 25 Charity in 2014 and 2016. We pride ourselves on our commitment to our donors and families, demonstrating excellence in transparency, governance, and accountability. Every donation makes a difference in helping young people across Canada. Donate today!